Posture is not only a product of ergonomics, it’s also greatly influenced by the strength and flexibility of your muscles. Making good posture a habit requires practice, but you don’t have have any special equipment or access to a gym to benefit from some simple posture-building stretches and exercises. Start incorporating these five exercises into your daily routine to combat soreness and build better posture. Try a torso twist: This stretch is great for anyone dealing with chronic back pain that gets worse sitting in an uncomfortable desk chair all day. To start, keep your feet on the ground and place one arm on the back of your chair. Twist your upper body toward the resting arm and hold your pose for up to 30 seconds. Then, repeat on the other side with your other arm. Start shrugging: Raise both of your shoulders up toward your ears and then drop them. Do this around 10 times every hour to keep your shoulders and neck from growing stiff. It might remind you to sit up straighter, as well. Give your legs a hug: Keep your feet planted firmly on the floor and then lean over with your chest on your knees as your arms dangle on the floor. Next, if you can, grasp your hands together underneath your legs and hold this position for up to 30 seconds. Hold onto your forearms or upper arms for an even deeper stretch. Repeat anytime you start to feel stiff at your desk. Lift your calves: Calf raises are one of the most simple exercise to do anywhere, as it only involves repeatedly lifting your heels off the ground. 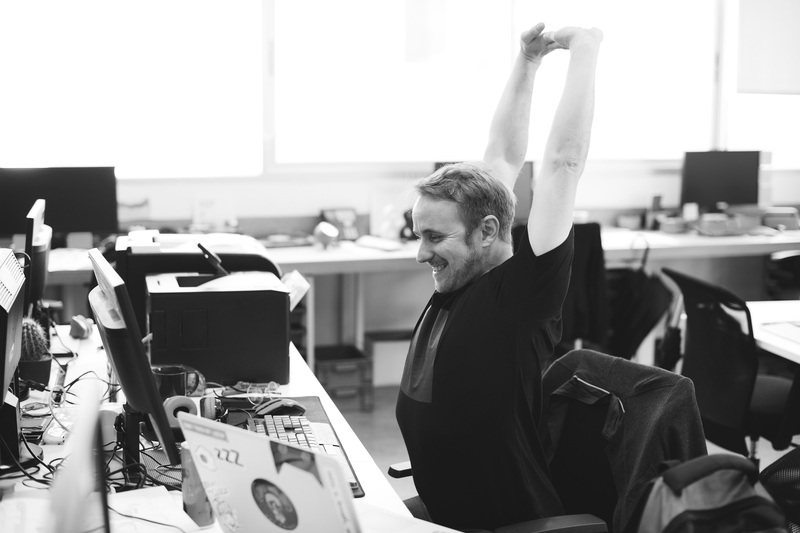 While you can do this at your standing up desk, you can also do them while waiting in line at the store, riding in your office’s elevator, or anywhere around your house. Lunges: Just gently lower your knee to the ground, while keeping your other knee bent and parallel to the ground. Lunges are known to improve hip flexibility, spinal health, and strengthen your core muscles.